We learned this week at the BNEF event that EVgo is expanding pretty quick, now serving 125,000 drivers and expects to make money off of fleet usage, improved utilization and federal, state and local subsidies. EVgo has almost doubled its network in the past year and expects it to double again in 2019 and 2020. This week’s pricing update, called the ‘2019 prices‘ seems to affect membership prices, upping the costs significantly, almost to non-member prices. 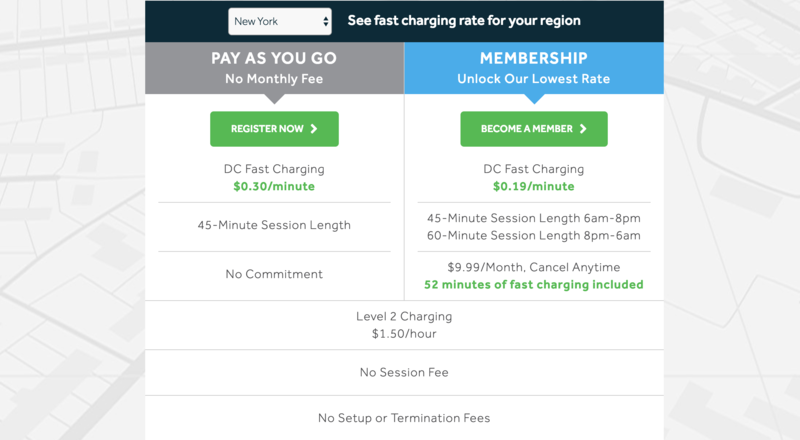 EVgo however, lowers the membership fee to $8 from $10/month but now includes few free minutes (only 29 minutes of free charging per month from 52 in New York for instance). Level 2 AC charging stays at the same $1.50/hour and usually tops out at 32A (7.7kW) depending on the station. EVgo has partnerships with Chevy, Ford and Nissan for charge access sold wholesale. New charging rates effective February 12th, 2019 for my home state of New York. EVgo also has broken California up into 4 different districts: San Diego area, Los Angeles area, San Francisco area and ‘other’ with different rates in each. Today’s news amounts to a lower monthly price for members. But higher rates for actual charging probably won’t be welcome news for long time EVgo users. I’ve had a love/hate relationship with EVgo and that continues to this day. On one hand, they are one of the earliest supporters of DC fast charging and their locations have benefited me personally. The skiing areas of Southern Vermont are served by EVgo stations in Bennington and Manchester. There is nothing else, including Tesla Superchargers until you go all the way to Albany, New York or Brattleboro which are about 50 miles away. I’ve used these chargers with my Chevy Bolt and via the Chademo adapter with my Tesla as well and they’ve really made my life easier. That said, EVgo stations are also a pain, especially compared to Tesla Superchargers. They used to only charge for 30 minutes (now up to 45 minutes or 1 hour during off hours with membership) and then would require you to go back to the station and re-initiate a charge. That’s a lot of fun in the snow when you are at a nearby restaurant trying to enjoy a meal. Since the company was spun off from NRG and sold to some venture capitalists last year, we’ve seen steady improvements. The app has been super helpful and has made the initiating charge process a lot easier (you used to have to call a 1-800 number if you weren’t a member!). 45 minutes of charge is certainly better than 30, but with long-range EVs, you still need to re-initiate. Also, I think EVgo has it wrong charging by the minute rather than the kWh. Again, when it is cold, I often don’t see anywhere near the 50kW charge that the company advertises and instead get a level 2-type of charge for the first 20 minutes while the batteries heat up. As EVgo expands into 150kW charging, this will become more and more annoying. You’ll be charged the same, whether you are charging at 20kW or 150kW. Let’s do the math on charging real quick. Say you are charging at 30kW for 2 hours to fill up your Chevy Bolt. That’s going to cost you $.30 * 120 = $36. That’s not a bad price but it ends up being about $.60/ kWh which is about triple the local energy rates. I get it, EVgo has to make some money and these rates aren’t terrible, but charge me for energy directly and I won’t be as stressed out at lower charging rates. They will end up making a lot more money when 150kW charging vehicles come out.